An aspiration for many of us is to create a gorgeous, super resonant guitar, one that has the features we want, is set up just right and plays beautifully. To reach this goal can take many years and if you are building the guitar yourself it is a steep (and often expensive!) learning curve to tackle on your own. Aim – This course is designed to teach you the most revered skills / experience required to assemble, level frets, cut nuts , set up a guitar project to custom shop quality and with superb playability. Delegates will have time be able to apply the skills on their own projects, thereby gaining real hands on experience and the most value and satisfaction from the two days. Attendees – Any guitarist, self-build enthusiast wishing to learn a high value set of skills and techniques that they can apply to their guitars at home or any future build projects. Schedule – the course is split into 2 days as below. Under string tension to enable best action and playability. Accurate nut cut and shaping. Detailed look at truss rod adjustment, the effect on neck relief for low action and best playability. Desire to be able to create , maintain custom shop quality guitars. A project at the ready to assemble stage, or at least a guitar that would benefit from fret work including, levelling, crowning, polishing and or nut work, set up. Please let us know your mid-week or weekend and month preference. We will be in touch asap to confirm a convenient date. Aim – This course is designed to transfer skill in the art of fret work. Delegates will have time be able to apply the skills on their own projects, thereby gaining real hands on experience and the most value and satisfaction from the day. Desire to have confidence and skill in the art of fret work. 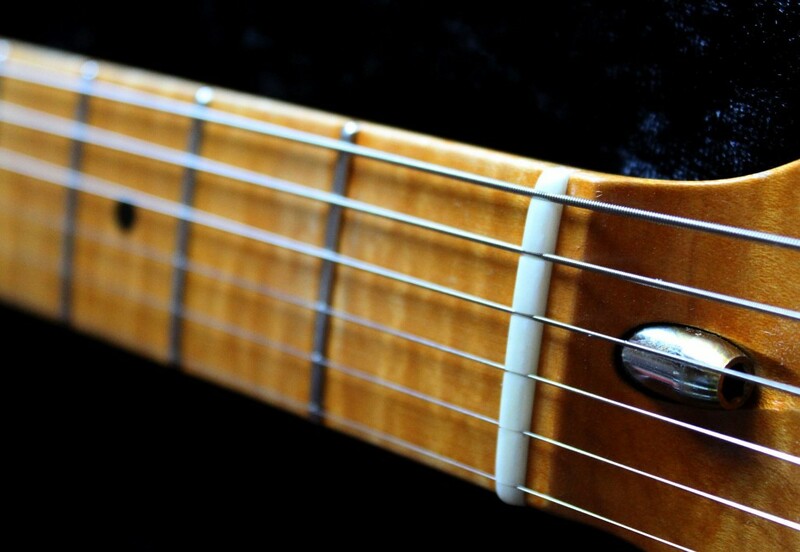 Guitar that would benefit from fret work including, levelling, crowning, polishing. Aim – This course gives you one full day to develop the key skills of your choice from the 2 day course agenda list. The objective is for you to quickly develop skills you need and also apply to one or two guitars you may bring along so they can be improved. For example your guitars may benefit from a fret level, trust rod adjustment and setup, or a new bone nut to improve playability and tone. 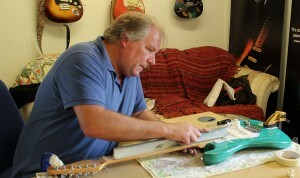 I have been modifying, setting up and servicing guitars for years and work on people’s guitars at home in my workshop, but with Andy’s expert guidance I was able to tackle two of the trickier skills I was not so experienced with, precision fret levelling and making, shaping and fitting bone nuts. The great thing about the course is that Andy offers a pick and mix style menu of things you can choose to learn, so if you already have experience in one area you can simply identify another and crack on with that, there is only so much time in one day, people wanting to learn everything on offer might benefit from doing more than one day. I found it very reassuring and confidence boosting to have someone actually there to watch over my work and correct and guide me as I went, giving me more insight in to why things are done a certain why and not others. In this day and age there are a multitude of Youtube videos you can learn from but I think many people and myself included will benefit so much more from having someone experienced in the room with them when first attempting to learn the more expert areas, no substitute! I took two of my guitars on the day that needed some attention to frets and had poorly made nuts, Andy even made me a precision machined compensated bone nut to replace the tone sucking LSR roller nut that was on one guitar, massive improvement! They are so much more playable and toneful now with those jobs done correctly, a real eye opener on how many small aspects really effect tone. After the day was finished I left feeling confident I could go away and apply these new skills. £80 deposit required to secure place on any of the above courses. Balance payable week before start date. LOCATION, Wudtone, Ty Wilson Barn, Llangwm , nr USK, Monmouthshire NP15 1LT, Wales UK. Onsite accommodation available at CO2 neutral B&B – book accommodation online via www.clearvewe.co.uk. “After 30+ years as a performing musician, guitar hoarder and tinkerer, I’d reached the stage where I understood what made a great guitar and a great set up yet after a couple of builds needed confidence to tackle nut cutting and fret levelling, dressing etc. I’d seen guitar set up courses advertised but they didn’t include nut cutting and dressing (a huge oversight) and I needed to learn this and more so Andy’s course was too good not to try. Anyhow I had two days of guitar build bliss with Andy and Paul my course mate and fellow guitar builder. We had both brought along our ‘can’t take this any further’ projects and were both able to work on them to completion which was an education and great bonus. “I have just arrived home after the second, and final day of Andy’s guitar workshop. Two of us took part in the sessions, I took my partly built guitar, and Dave took his rather beautiful green S-type project. The two day course covered a lot of ground including fret levelling, crowning the frets, fitting and cutting the nut. I have tried to do this before, but with limited success, however with Andy’s guidance and help I have learned how to achieve these skills accurately and efficiently resulting in a guitar that is really lovely to play, and I now have the skills and confidence to improve my other previous efforts!